If you’ve been reading our posts here, you probably noticed that we like to give our “Why Projects Fail” talk. (If you’re curious, here’s a link to the slides [PDF].) One reason we really like it is that it seems to go over well with a lot of different audiences, from hard-core architects and programmers to grey-haired project managers. It’s a pretty informal talk — we interrupt each other and go off on the occasional tangent, which keeps the mood pretty light. And that’s always a good thing, especially when you’re doing a talk to people at a PMI meeting or a user group who just spent the day at work and don’t need to sit through yet another boring slide presentation. There’s something we call the “about three weeks” problem. Have you ever noticed that when you ask a programmer how long it’ll take to do something, it’s always going to take “about three weeks”? I’ve done it myself many times over the last fifteen years or so. How long to build a simple website to do a few calculations? About three weeks. What about a utility that will automate some file operations and generate a few reports? About three weeks. A new feature for our core product? Sure, it’ll take about three weeks. See, the problem is that three weeks seems like a long enough time to get something significant done. And if you think for thirty seconds about pretty much any programming project, you can do enough hand-waving and ignore enough details so that it’ll seem to fit into about three weeks. 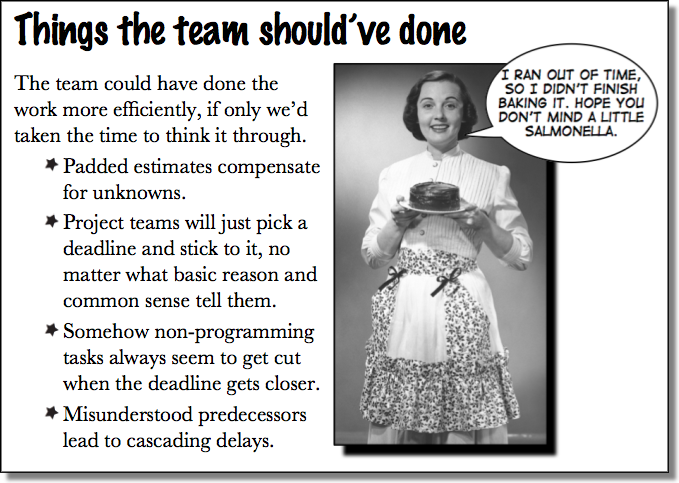 What does this have to do with why programmers are so reluctant to give estimates? And there it is. Nobody wants to go on the record and say how long they think it’ll take to do a job. We all know it’ll take as long as it takes. If the estimate is right, then there’s no great reward or recognition. But if the estimate is wrong, then we’re on the hook for it, and we get to look forward to status meetings where we get to take the blame for whatever terrible consequence happened because the project was late. Jenny and I put a lot of thought into this problem when we were working on our first book, Applied Software Project Management. It turns out that there’s a really effective way to get a good idea of how long the software will take without putting any one person on the hook, and it’s our favorite way of generating estimates. It’s called Wideband Delphi, and we talk a lot about it in the Estimation chapter in the book (which you can download for free [PDF]). It’s a straightforward technique — it just takes two two-hour meetings to nail down estimates for even a large project. It’s very iterative and highly interactive, which helps the team all come to a consensus and agree on the final result. It’s collaborative, so that no one person is solely responsible — usually, everyone ends up buying into the final numbers. And best of all, it doesn’t require any special expertise beyond what you need to actually do the project. One nice thing about Delphi is that it’s not some esoteric, theoretical thing. Both Jenny and I have done this in the real world, many times, with all sorts of software teams. Delphi really does work, and it actually does a good job of helping team come up with numbers. And those numbers are pretty accurate, at least on the projects I’ve worked on. If you’re having trouble convincing your reluctant team to come up with an estimate, I definitely recommend giving Delphi a shot.